How many MT4 or trading terminals can i run on my VPS? How many MT4 terminals you can run on your VPS depends on a few things. How many charts are you running on each MT4? How many EAs on each MT4? A conservative guideline is 2-4 MT4 terminals (with a handful of charts) per CPU core but, this will depend on each clients overall configuration. Be sure to not overload your VPS CPU usage and leave CPU available for very active market sessions which have higher CPU demands. Performance optimizing your MT4 terminals should allow running more. If you need help optimizing your VPS MT4 terminals inquire on the best practices with support. It is best to run each MT4 on a VPS as “lean” as possible. Run only exactly what is needed and nothing more. For example when using a trade copier EA such as ours (at SimpleTrader.net) that means 1 chart and 1 EA in total per MT4. Do not run a single indicator or EA you don’t have to. Hiding symbols that you know for sure you will not trade is recommended. This will save memory and cpu usage. VPS CPU usage can be monitored with Windows Task Manager (shortcut CTRL-SHIFT-ESC). Maintaining CPU usage below 80% (on average) to allow for resource usage spikes is recommended. VPS Memory (RAM) is very important to monitor when you have a VPS. 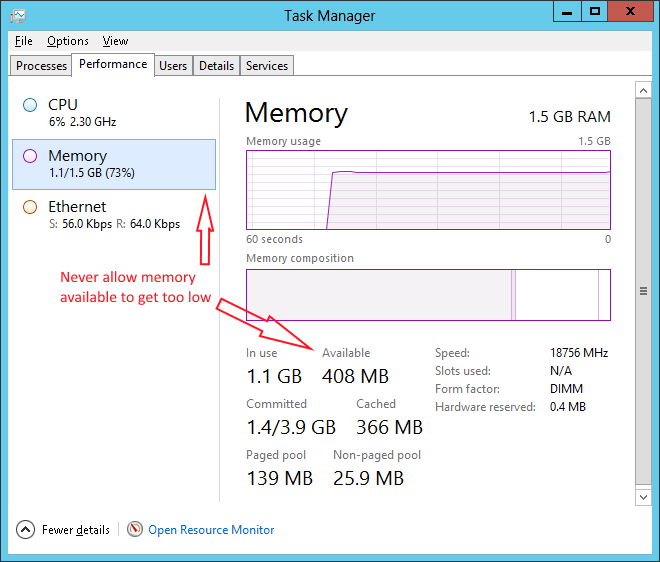 Monitor your memory by using Windows Task Manager (shortcut CTRL-SHIFT-ESC). 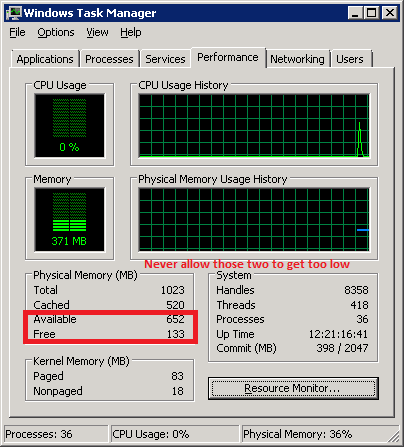 On the Performance tab of Windows Task Manager make sure the “Available” and “Free” fields (in Windows 2008) don’t show that you’re running too low. We consider low as being less than 150Mb in aggregate remaining. If you need more memory for your VPS inquire on an upgrade with support. Which VPS plan do i need? At ForexVPS.net we do sell VPS plans with more CPU cores but, we actually recommend for MT4 traders the Basic+ single CPU core VPS plan instead of buying the Standard or Professional plan for multiple CPU cores. In testing we’ve found MT4 doesn’t run as well (when virtualized) with heavily loaded or a large number of MT4 terminals running on multiple CPU core plans like in the larger Standard or Professional VPS plans. In our experience, you are better to use multiple VPS’s and split your platforms between them instead of investing in a multi core server because you’ll get better performance for your investment. Monitor your VPS CPU and memory usage with “Windows Task Manager” (shortcut CTRL-SHIFT-ESC) and when you see CPU utilization too high persistently then you should buy an additional Basic+ plan. Memory upgrades are available at any time for any plan. Please note the Basic plan VPS is designed to run 2 to 4 terminals depending on their exact configuration.